Italy, Greece and Montenegro are yours to discover on this magical 17 day two-for-one package with flights, cruise and more. Explore the stylish city of Milan, the famed canals of Venice, arts and culture of Florence and historic monuments of Rome on tour. Then, climb aboard the 4-star MSC Magnifica for a dazzling cruise among the Greek Isles and beyond. From Venice, sail down the coast to the historic city of Bari before travelling towards Greece. 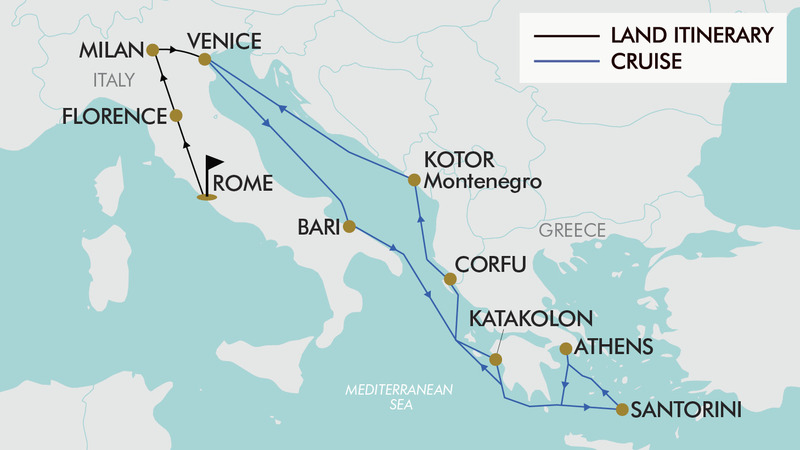 Sail to Katakolan, gateway to ancient Olympia - birthplace of the Olympic Games; visit Santorini, renowned for its iconic white-washed cliffside villages; dock in Piraeus, the port of Athens; and the gorgeous island of Corfu. Kotor, a hidden gem of the Adriatic Coast, will delight with its towering cliffs, charming coves and medieval buildings. This once-in-a-lifetime package for you and a friend includes return international flights, a seven-night MSC cruise, seven nights in 4-star hotel accommodation, 27 meals and much more! Depart from either Auckland or *Christchurch for your flight to Rome. Fly with airlines such as Etihad Airways, Emirates, Qatar Airways, Singapore Airlines, British Airways, Lufthansa, Swiss Airways, Austrian Airlines and Cathay Pacific to name a few (subject to availability). Upon arrival, be met by your English-speaking Tour Leader and transfer to the hotel. After breakfast, be met by your local guide and enjoy a tour of Rome - the Eternal City (approx. 3 hours). The tour begins at the Trevi Fountain, which has become an iconic spot thanks to its inclusion in the movie ‘La Dolce Vita’, directed by Federico Fellini. The tour will take you to the streets of the old town, visiting famous sites such as the Pantheon (entrance not included); the Palazzo Madama, which houses the Senate of the Italian Republic; and the Navona Square, which was built on the ruins of the Domitian Circus. Once the tour finishes you can enjoy the rest of the afternoon at leisure. If you have your sights set on visiting the famous Colosseum or Vatican Museum during your free time, we strongly advise pre-purchasing tickets online to avoid excessive queue times. A Vatican Museum and Sistine Chapel optional tour (not included) is available for purchase in the cart. After breakfast, you will continue your Italian journey to Florence in the heart of Tuscany. Upon arrival, check into your accommodation and enjoy the afternoon at leisure. You might like to take in some of Florence’s beautiful sights such as the Piazzale Michelangelo, the medieval Ponte Vecchio, the Duomo, Uffizi Gallery or the Gallery of the Academy of Florence. Optional tours (not included) to the Uffizi Gallery and the Gallery of the Academy of Florence are available for purchase in the cart. After breakfast, enjoy a guided tour of this incredible city (approx. 3 hours). The tour will take you through some of the famous sights and attractions, including the Santa Maria del Fiore Cathedral and Piazza del Duomo. Piazza del Duomo, together with Piazza San Giovanni, represent the heart of the city. The most important religious monuments of Florence are here, linked by their geometric design and characterised by the typical white, green and pink marble coating. You will see the Baptistery (entrance not included) with its octagonal shape and three bronze doors; the Cathedral (entrance not included), built in Florentine Gothic style; and Giotto’s Bell Tower, regarded as one of the most beautiful towers in Gothic architecture (entrance not included). The tour will continue through Piazza Signoria to the Palazzo Vecchio (entrance not included), the town hall of Florence. Admire the impressive statues that surround the piazza, before continuing to the Straw Market where the tour will end. Enjoy time at leisure for the rest of the day. After breakfast, depart to Milan. Upon arrival enjoy a guided city tour (approx. 3 hours). Celebrated as the Italian capital of fashion and design, Milan is a city rich in art, history and culture. The tour begins from Sforza Castle (entrance not included) before walking towards the Duomo (entrance not included). On the way, admire elegant buildings along two of Milan’s iconic streets - the Via Dante and Via Dei Mercanti. Piazza del Duomo is the heart of Milan, and the Duomo - where German influences are softened by the finesse of Italian artists - is one of its most significant Gothic style monuments. From the Piazza Duomo, the tour continues through the Galleria Vittorio Emanuele, Italy’s oldest active shopping mall and a major landmark of Milan, before arriving at the Piazza Della Scala, home to one of the most famous theatres in the world; La Scala (entrance not included). In the afternoon, begin your journey to Venice. Upon arrival, be checked into the hotel and then spend the rest of the day at leisure. After breakfast, you will be transferred to the Tronchetto Pier in Venice, where you will be able to admire the beautiful buildings and canals of Venice by water bus (ferry). Upon arrival, be met by a local guide at the Piazza San Marco to start a guided tour of Venice (approx. 2 hours). The tour starts at the iconic St Mark’s Square, one of the most beautiful squares in the world, and the hub of Venetian life. Around the square, you will see the famous St Mark’s Basilica, the Doge’s Palace, and the Bell Tower. The church was built to house the body of St. Marc, transported from Alexandria in 828AD. Inside the basilica you can admire glittering Byzantine Mosaics (entrance not included). The tour will continue onwards to Rialto Bridge, one of the most beautiful bridges and an icon of the city. In the afternoon head to the cruise terminal to embark on the exciting 7-night Mediterranean cruise aboard the spectacular ‘MSC Magnifica'. The cruise departs at 5:30 pm. An ancient city just waiting to be discovered. It’s worth doing an excursion just to wander around the old city of Bari (not included), an entrancing jumble of streets that are the most mind- bending places to walk around. Katakolon is a tiny port town situated 30 minutes from Olympia, the ancient home of the Greek games which can be discovered on an optional shore excursion (not included). Alternatively, the town itself is very pretty, with great local dining options, views of the sea and the chance to take a swim. Santorini embraces all that has made the Greek Islands legendary - beaches, unparalleled architecture, dramatic cliffs and quaint villages. Ride a cable car (not included) to the top of Thira and admire the spectacular views over the sea. Piraeus has been the port of Athens since Classical times, when the so-called Long Walls, scattered remnants of which can still be seen, were built to connect it to the city. Today it’s a substantial metropolis in its own right. The island ferries leaving from the port where your MSC cruise ship awaits your return are the reason most people come here; if you’re spending any time here, though, the real attractions of the place are around the small-boat harbours of Zéa Marina and Mikrolímano on the opposite side of the small peninsula. Here, the upscale residential areas are alive with attractive waterfront cafés, bars and restaurants offering some of the best seafood in town. Corfu, an island off Greece’s northwest coast in the Ionian Sea, is defined by rugged mountains and a resort-studded shoreline. Its cultural heritage reflects years spent under Venetian, French and British rule before it was united with Greece in 1864. Corfu Town, flanked by 2 imposing Venetian fortresses, features winding medieval lanes, a French-style arcade and the grand Palace of St. Michael and St. George. The medieval Old Town of Kotor; the undisputed jewel in Montenegro’s crown. Though no longer Europe’s best-kept secret, Kotor’s sudden elevation to the tour-cruise league has failed to dim the timeless delights of its cobbled alleyways and secluded piazzas. Enclosing cafés and churches galore, the town walls are themselves glowered down upon by a series of hulking peaks. Enjoy your last breakfast on-board before disembarking where you will be met by a tour representative and transferred to the Hotel. Relax for the rest of the day in Venice. Today after breakfast be transferred to the airport for your return flight home. Please note: some flights may arrive in New Zealand +1 day later. Travel offer is valid for travel on selected dates until the 24th of November 2019. This travel offer is priced for 2 people based on twin share. - An outbound OR inbound stopover may be chosen; not both. - On any upgrade purchase, short haul flights, Trans-Tasman, and domestic flight sectors are not guaranteed in a Premium or Business cabin; subject to aircraft configuration. - Rome (Pre Tour): $185 per room. - Venice (Post Tour): $185 per room. - Valid for Children 2 years old and over. - Rome Day 3: Vatican Musuems and Sistine Chapel tour: $185 for 2 people. - Florence Day 4: Uffizi Gallery: $185 for 2 people. - Florence: Day 4: Gallery of the Academy of Florence: $140 for 2 people. - prices are for 2 people, are subject to availability, time permitting and weather conditions. - Visa fees and requirements (Not required for Europe if travelling on a New Zealand passport for stays up to 90 days). Cruise: €10 (approx. $17 NZD) per person, per day, payable onboard at the end of the cruise. Additional extra’s on board will also have a gratuity of up to 18% charged on top. We recommend dressing in layers as there can be significant changes in temperature throughout the day. Wear good walking shoes, jeans or heavy cotton pants, a light cotton shirt plus a sweater/jacket and to fit in with the local Italians, a scarf. Expect temperatures ranging from highs of 16°C to lows of 7°C. During this month, the average sea water temperature for the beaches around the islands is 20°C, which is just about warm enough to enjoy a dip. A valid international certificate of vaccination against Yellow Fever is required in many countries. You may need to present this on arrival at the airport or border crossing. Some countries will refuse entry if you are unable to present your certificate. It's also quite common for your home country to request a Yellow Fever certificate on your arrival back home. It is your responsibility to check with your doctor well in advance of leaving home about the Yellow Fever requirements for the countries you'll be visiting. The recommended tip for the tour leader and driver is €5.00 per person per day, which will be collected whilst on tour. This covers both the tour leader and driver. Gratuities (tips) are not included in the tour price for the services of the cruise staff throughout the cruise component of this tour. MSC Cruises is an internationally registered company & operates to US & European standards, both of which have an economy driven by a gratuities culture. Gratuities are expected on your cruise and will be charged to your onboard account at €10 per person per day. If you believe you are not receiving the standard of service expected on your cruise, you may reduce or remove the gratuities charged to your onboard account at the cruise reception desk. Although expected by MSC Cruises they are a discretionary payment. Please note; additional extras purchased onboard will also have a gratuity of up to 18% charged on to of the normal ship board gratuity. A tourist visa is not required for Europe for stays up to 90 days if travelling on an New Zealand passport.